Eventually I realised that part of it was that I didn’t have any self-belief in my writing. I saw writing as a mysterious art that I just was never going to get the hang off. I didn’t see myself as someone who could write a complete story arc. Now let’s take a step back, I have always been a storyteller, I’ve written plays, films and TV shows. I’ve published poetry and taken part in oral storytelling competitions. I’ve written backstories and histories for characters and games. Seeing a story through and working with character, plot and series arcs isn’t new to me but I treated writing stories as a separate beast. So I started to plot. Finding a theme/device/character/world that I want to work with, sometimes this is from a challenge, sometimes it’s an idea that strikes me. A stream of consciousness exercise/mind mapping/question and respond. Now these are basically all the same and for the most part I do them all at the same time. 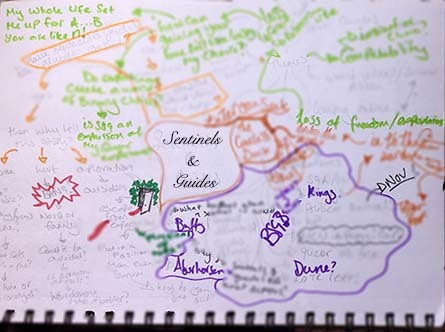 I create a mind map that has the core inspiration at the centre and then start in one corner with a stream of consciousness, I write down everything that comes to mind for that idea. From that I start to branch out, asking questions and jotting down ideas. If I hit on a question that I have more than one answer for I build off it. Finally I mind map out some ideas of how core arcs of the story could go. This is rambly… let me show you. Now this is the base of my plotting for July’s Rough Trade (2016) ‘Little Black Dress’ where you are challenged to work on three stories in any fandom but you have to make it a Sentinel fusion. I’ve blurred most of this as it is just questions and world building but I’ve left some bits un blurred so you can pick out what’s going on. next I moved up to the top left when a question about Buffy made me start thinking about themes (for those who are interested the question was “Have sentinels always existed or are they new? If they aren’t new is it outside of their role in society to kill demons?) This lead to all the green, green is question and response. 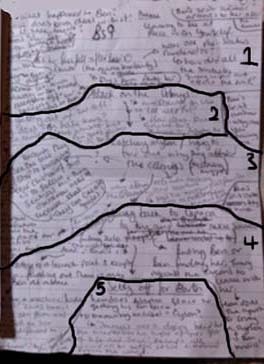 Finally one of the questions drew me into thinking about story arcs and I plotted out 3 answers to “then why tell this story” this takes up the bottom right and has the doodles. Next comes the idea tossing, now sometime I might have started from here if my inspiration was a story idea jumping into my head. I use this to build pretty much everything I write from official reports to thesis papers to plays to fanfiction. Again I use a mix of question and response alongside stream of consciousness. for each section I give a central ‘point’ for example the central point of section 1 is ” how did the Cylon’s destruction of Sentinels in the first war effect the treatment of latter day Sentinels?”, section 2 has “Attack on the Colonies” and so on for each section, sometimes a question I need to explore and other times a key event. From this document I then research any questions I came up with that I can’t answer off the top of my head or do some world building to make it make sense. 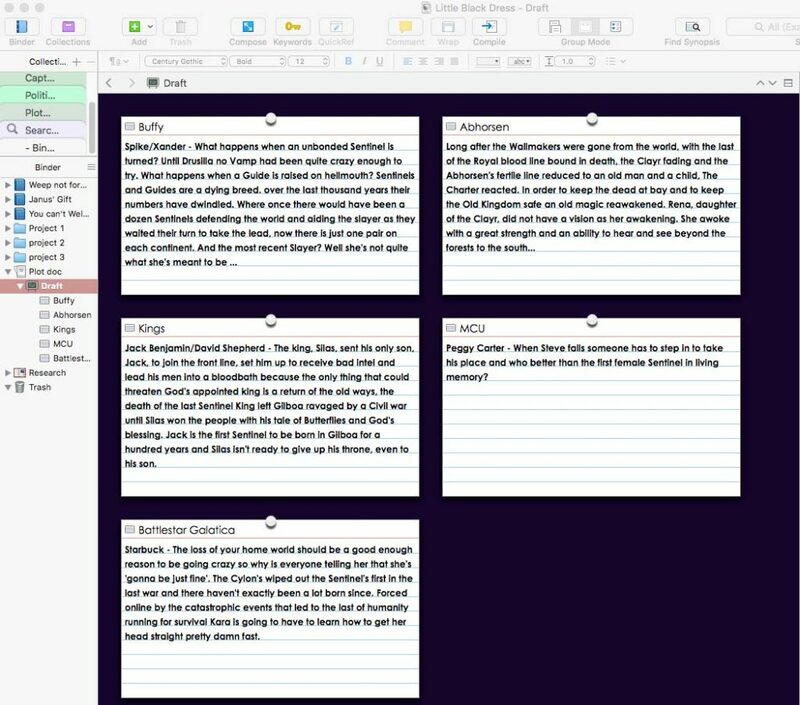 Then I move it all into Scrivener and make it look pretty. Build a playlist, produce a video and make a banner.